GGPC LOGITECH G NOVEMBER WINNER ANNOUNCED! Ohhh YEAH! It’s a new month and we’ve got some epic new prizes for those grabbing themselves a new Gaming PC! If you get yourself a Good Gaming PC this November you can register to redeem a G240 Gaming Mouse Pad to go with your new GGPC + you’ll go into the draw to win some of the latest gaming gear! A great mousepad for any mouse, but that’s not all, our MASSIVE November Gaming Prize Pack will also be going out to one lucky gamer! Our November Grand Prize Pack is packed full of the latest Logitech G Gaming Gears that have just released worldwide! Up first we have the new G Pro HERO Wireless RGB Gaming Mouse which features the HERO 16K, the most powerful sensor created by Logitech G! Next up we have the first Logitech G keyboard also wears the emblem of Pro 🙂 Designed and built to the exacting standards of some of the world’s top esports athletes, our lucky winner is in for a treat with the G Pro Gaming Keyboard on their desk! Engineered for extreme performance and designed to win, the short-throw Romer-G switches actuate at just 1.5mm, making them around 25% faster than the competition’s standard mechanical switches. Providing a perfect blend of speed, precision and quiet performance, this Logitech G Pro Gaming Keyboard is the stealth assassin of mechanical gaming keyboards. To complete this epic setup we’ve got a really excellent Gaming Headset too! The new G Pro Gaming Headset will have our lucky winner hearing everything with greater precision, from quiet footsteps to gunshot audio signatures to voice comms. Patent-pending, hybrid-mesh Pro-G™ audio drivers solve common distortion problems to deliver booming bass and precise clarity. Pro Gaming Headset is compatible with Windows 10 surround sound features like Windows Sonic for headphones and Dolby Atmos for headphones for accurate positional audio. Directional audio combined with exceptional clarity provides precise awareness of everything that’s happening around you. Premium leatherette ear pads were selected for Logitech G PRO Headset to create a seal around the ears for improved passive noise isolation. Get incredible comfort with soft foam padding and reduce distractions with up to 50% more sound isolation than other ear pads. Also included in the package are soft micro-suede leatherette earpads. Pro-grade advanced condenser microphone performs with wider frequency response, lower signal to noise ratio and higher sensitivity. Designed for improved clarity with a full-size pop filter, your voice comms come through loud and clear. built to be extremely lightweight, strong and extremely comfortable. To achieve that, PRO headset uses advanced materials including TR90 nylon in the headband, stainless steel sliders, and glass fibre reinforced nylon joints. The lightweight construction with polymer shell and fork is perfect for long periods of wear and competitive gaming. Incredible gear, amazing November fun ahead – check out the latest range of Good Gaming PC builds today! GGPC Logitech G October Winner Announced! CONGRATULATIONS TO ERIC P – Winner of the October Grand Prizes below! And our October Grand Prize Pack is pretty epic indeed, a full setup comprised of our most recommended Logitech G Gaming Gears! Included in this months GGG Prize Pack is the outstanding Logitech G502 Proteus Spectrum RGB Gaming Mouse which is one of the top-rated Gaming Mice in the WORLD! The Logitech G502 Proteus Spectrum Gaming Mouse with full RGB LED Lighting and tunable weight options included. Get maximum tracking accuracy from the responsive PMW3366 optical sensor which works with exclusive Logitech G Delta Zero optical sensor technology to minimize mouse acceleration and increase reliable targeting. Adjustable RGB lighting lets you select from up to 16.8 million colours and as our lucky winner is going to have a complete setup, Logitech Gaming Software will allow them to customise everything, and you can then set this theme over the whole kit – synchronizing lighting patterns and effects to bring the gaming setup to life with breathing or light cycling! When it comes time to play you can have your setup adjust to pre-loaded colour configurations automatically, each perfect setup highlighting the keys for the specific game you’re playing! Next up we have the first Logitech G keyboard to carry the name Pro 🙂 Designed and built to the exacting standards of some of the world’s top esports athletes, our lucky winner is in for a treat with the Logitech G TKL Pro Gaming Keyboard on their desk! Engineered for extreme performance and designed to win, the short-throw Romer-G switches actuate at just 1.5mm, making them around 25% faster than the competition’s standard mechanical switches. To complete this epic setup we’ve got a really excellent Gaming Headset too! The Logitech G933 Gaming Headset features advanced Pro-G audio drivers are made with hybrid mesh materials that provide the high-quality audio performance gaming demands. These Pro-G drivers deliver both clean and accurate highs as well as a deep rich bass that you would expect from premium headphones so you can experience incredible 7.1 surround sound with Dolby or DTS Headphone:X Surround Sound. These audio technologies help to create a more lifelike in-game special awareness, allowing you to clearly hear enemies sneaking around. Amazing gear, amazing October fun ahead – check out the latest range of Good Gaming PC builds today! GGPC SteelSeries September Winner Announced! Congratulations to Carley L – winner of our September SteelSeries Grand Prize Pack! Throughout September, if you purchased a GGPC Ready-to-Run Gaming PC and you can register to redeem a BONUS SteelSeries QcK Mousepad to go with your new rig. The SteelSeries QcK Mousepad is made of high-quality cloth material, providing a precise and consistent glide. Featuring a specially designed non-slip rubber base which prevents the pads from sliding, no matter what surface the mouse pad is placed on. A wonderful mousepad for any mouse, but grabbing this awesome bonus will also put you into the draw for our MASSIVE September Gaming Prize Pack which will be going out to one lucky gamer! IMPORTANT: To be in to win the MEGA Prize you must register for the SteelSeries QcK Bonus! Our September Mega Prize Pack contains three awesome pieces of top-tier gear fit for a professional gamer, the first being the outstanding SteelSeries APEX 350 Gaming Keyboard! This gaming keyboard designed to enable users to react quickly, move strategically, and customize its performance for every game. Beyond just choosing from 16.8 Million colours, the Apex features ActiveZone lighting, a visual support tool allowing the user to independently customize each of its 5 zones and in multiple macro layers. Our next SteelSeries Prize goes perfectly with the gaming keyboard above – the SteelSeries Sensei 310 Gaming Mouse! With both hands covered our winner is also going to take away great headset as well, and for that, we’ve got the SteelSeries Arctis 5 7.1 Gaming Headset! Widely recognized as the best mic in gaming, the retractable Discord-certified Arctis ClearCast microphone delivers studio-quality voice clarity and background noise cancellation. Specifically designed for the PC Gamer, Arctis 5 combines independent game and chat control, cutting-edge DTS surround sound, and dual-zone RGB illumination to create the perfect audio solution for your battle station. Massive thanks to SteelSeries New Zealand for all the awesome gear – check out the latest range of GGPC systems and good luck to everyone for the September Grand Prize Draw! UPDATE: The Cooler Master MasterMouse Pro L is available in New Zealand now! Another awesome piece of gaming gear from Computex is here! Arm yourself with the MasterMouse Pro L and customise your grip with modular top and side covers. This new kind of gaming mouse reminds us a bit of the James Donkey 007 and includes 2x unique top covers combined with two pairs of magnetic side panels. This allows for several grip configurations so you can make a mouse that works best for you and the games you are wanting to play 🙂 Another cool bit is that Cooler Master have made 3D Print models for the MasterMouse Pro L available freely if you would like to make things for yourself, just like they did with the recently announced MasterPulse Headset. Nearly every inch of the MasterMouse Pro L’s body is covered in a matte UV coating – this is highly durable and won’t peel, wear, or tarnish. Both of the main buttons are equipped with Omron switches guaranteed to last 20 million clicks and the cable has been built to endure even the most dedicated gamer 😛 We shall see CM… Challenge accepted! The MasterMouse Pro L offers 8 programmable buttons that can be easily expanded up to 14+1 switch button thanks to the Storm Tactix function. Assign the Storm Tactix button based on your preference and press it to enable your secondary button functions. There is also a DPI switch which is found on the bottom right side of the mouse but even this can be reassigned to any other button, great news for the snipers among us who are looking to switch DPI levels on-the-fly. Lucky for us we were able to get hands on with this one a little early and it’s very impressive! 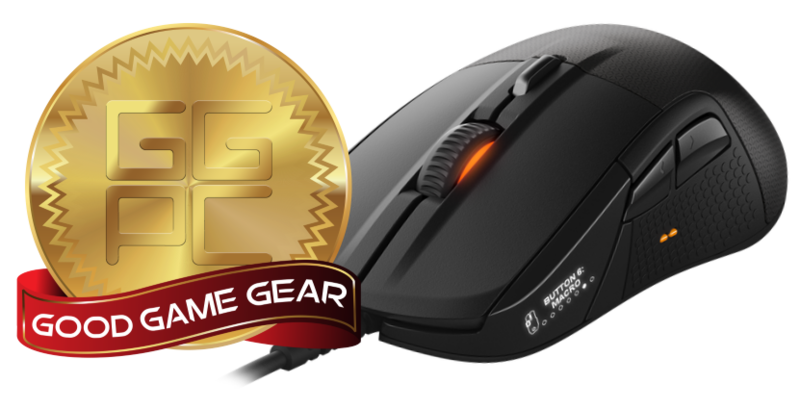 On that note we happily give this new breed of Cooler Master gaming mouse our GGPC recommends award – The MASTER MOUSE IS GOOD! Keep your eyes on the GGPC Computers Blog for more of the latest and best in Gaming Gear! Good Gaming Mouse – MasterMouse S incoming! Just announced – the new MasterMouse S is coming to New Zealand soon \o/ A small and elegant gaming mouse that aims to provide a secure and satisfying grip. The body of the mouse sports five buttons (not including the dpi switch), one of which is a secondary function button that will allow us to map another command to the other four buttons – we like this layout as it’s easy to use and allows for some pretty handy hotkeys to be activated directly from the mouse, simply mapping health and mana potions to a single button and having the shifter let you activate either is pretty sweet but things get really cool when you map a steady fire macro as the alternate left click function, unloading a whole clip accurately at range is a killer. They actually call this shifter button the “Storm TactiX” which does sound a bit cooler than the shift term we like to use 😛 It’s located just under the base of your thumb for very easy access. The MasterMouse S has onboard memory, so we can save our macros within five profiles, with everything being saved on the mouse. 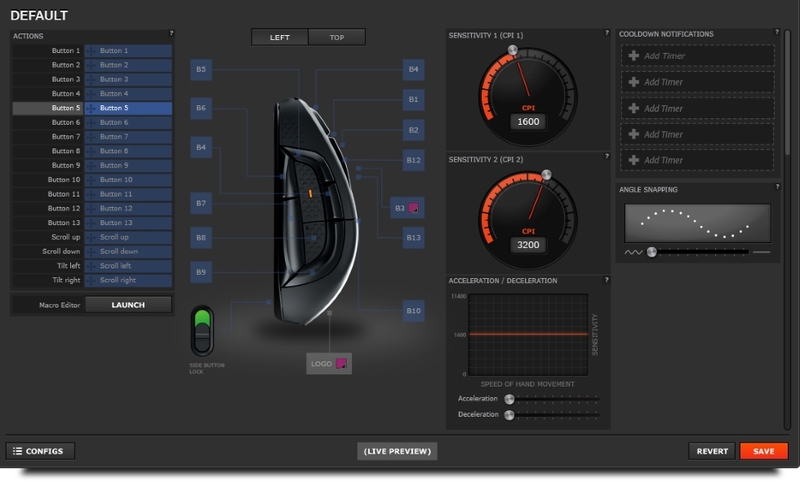 These profiles can also save unique settings to each with two RGB illumination zones, there is one along the rim of the mouse wheel and one at the rear edge and both be customised with the usual spectrum of 16.7 million colours as well as a range of effects that can be assigned to each of the zones independently. Aside from all this good stuff we get all the other usual premium bits like a matte UV coating that is easy to clean and resistant to finger smudges, main buttons equipped with those glorious Omron switches which can take a beating and a nice patterned PVC cable which at 1.8 meters long is pretty savvy for a little lounge room gaming. Both the new MasterMouse S above and another MasterMouse S Lite version are heading to New Zealand now, we’ll update our GGPC Computers Blog as soon as we get our hands on one! The Rival 100 optical gaming mouse brings unmatched performance that’s usually unseen in entry level gaming gear with six programmable buttons, a really good sensor and SteelSeries Prism RGB illumination 🙂 Sporting a sleek, smooth shape with textured sides for lift off grip it’s a pretty normal looking mouse when you first look at it but once it’s in your hand the quality shines through and this very affordable gaming mouse has got the goods where it counts – it’s packing a special optical sensor inside so you can quick turn with confidence, the 1.9 meter non-braided cable is very light, as it the mouse. The side button layout is excellent with both buttons being easily pressed by simply rolling the thumb up a little much like the Rival 500 but less complicated, perfect for MOBA gaming like DOTA 2. UPDATE: These awesome gaming mice available in NZ now, keep your eyes on our GGPC Computers Blog and new SteelSeries Store for the latest! Good Gaming Mouse – G403 Prodigy Wireless from Logitech G! The Prodigy G403 brings together supreme comfort, quality, and durability in a wireless mouse that’s built for speed, accuracy and endurance. With a 1ms report rate, G403 is up to 8x faster than standard mice, when the mouse is moved or clicked, the response is near-instantaneous allowing us to be more accurate than ever been before. The G403 Prodigy features the world’s most advanced gaming mouse sensor, used by eSports pros worldwide and it is exceptionally precise and consistent so you can respond quicker and enjoy more accurate targeting. With a lightweight construction and included 10g removable weight, you have options when it comes to tuning the mouse to your preferences. Advanced buttons use metal springs to help keep the left and right mouse buttons primed to click, reducing the force needed to click and delivering exceptional click feel, response, and consistency. Battery life wise the mouse holds its charge well and we were able to game with no interruptions for a full night, should the gaming session last so long that you do need to charge simple connect the cable to front of the mouse and continue gaming on 🙂 This charging cable can also be used as a USB wireless dongle extension thanks to a handy adaptor included in the box. Logitech G403 Prodigy Gaming Mouse can be fully configured using Logitech Gaming Software to quickly match to your preferences. As with other recent gear from Logitech G you can use this software to choose from a palette of up to 16.8 million colours and brightness levels(both the logo and a laser strip on the mouse wheel) to match your favorite team, personal style, system or environment. Advanced users can configure the 6 programmable buttons to simplify in-game actions via the Logitech Gaming Software and quickly execute complex tasks, you can then save your settings to the memory on the mouse and use your settings on any PC without needing additional software or requiring a log in to use them. With onboard memory, you can take your settings with you wherever you go. On-the-fly DPI shifting that lets you program and switch between up to 5 sensitivity settings, from pixel-precise targeting (200 DPI) for sniping, to lightning-fast maneuvers (up to 12000 DPI) for fast and accurate 180-degree turns. 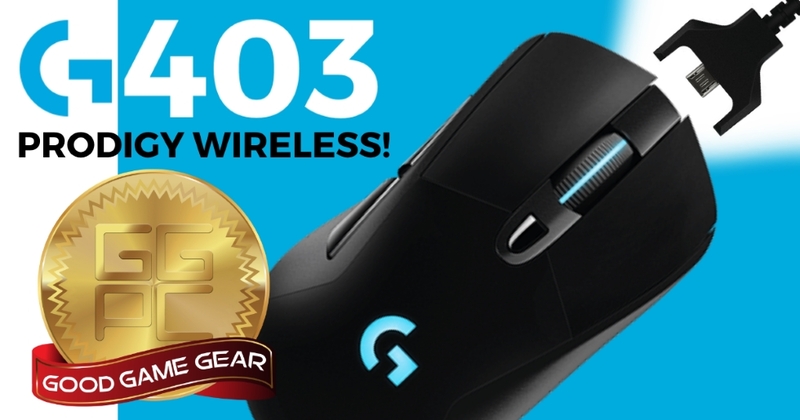 It’s not often we see a mouse this good, and after a long weekend gaming with it we happily give this mouse our GGPC Recommends Award – The Logitech G403 Prodigy Wireless Gaming Mouse is GOOD! The new layout places your thumb in a comfortable central position from which you can easily make a slight adjustments (almost like smudging) to hit up, down, forward or backwards without actually lifting your thumb from this new home position and without having to push directly down on the buttons – awesome right! They’ve also included vibration functions like they did in the excellent Rival 700, these haptic feedback ques can be used to alert you to low health, cooldown timers and more. Configuring this is done pretty easily thanks to the software package called SteelSeries Engine 3 and with the feature GameSense your games and gear become one. SteelSeries Engine 3 talks directly to your game, which changes your device’s illumination in real time, based off of in-game events. Ammo, health, kills, money, and cooldown timers are just a few things that you can integrate into your gear and if that’s not good, i’m not sure what is! While the design lends itself to a better experience playing MMO games like World of Warcraft it’s also rather good at MOBA hits like DOTA 2 and League of Legends, we’ll be testing things out and will update this blog with any tips, tricks or interesting configs we find along the way! 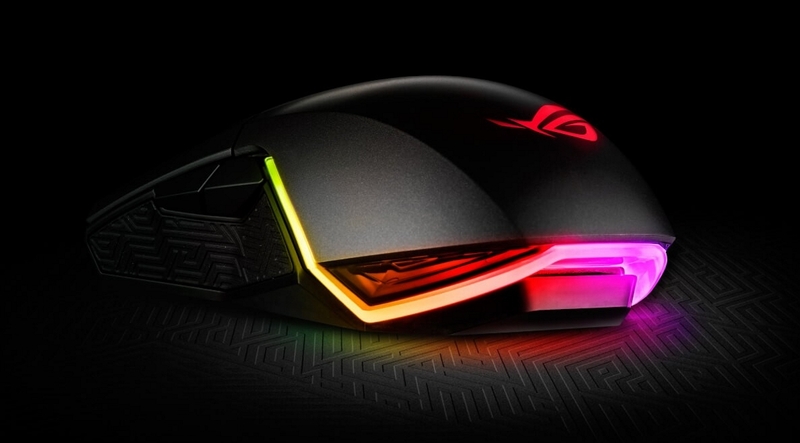 The Rival 700 gaming mouse features the first fully customisable OLED display, and also tactile alerts giving real-time information and in-game notifications that you can feel rather than see. With this mouse no two alerts need to be the same, you can choose which in-game events automatically trigger a tactile alert and you have complete control over how each one feels – health, ammo, mana, disables, headshots, and stuns can all be individually set to start a Tactile Alert. Tweak the vibration patterns, duration, triggers to suit you, you might want an alert that feels like a heartbeat when you are low on HP or set an alert to do a quick buzz to let know you’ve got that last hit. The Tactile Alerts have been carefully placed in the center of your mouse, so you feel the pulse strongly in your palm. By directing the pulse to only move up through your hand, as opposed to left and right, Tactile Alerts will not impact your mouse’s tracking so you can keep your aim perfect. We’ve put this great new mouse through some extensive GGPC in game testing and it’s very comfortable indeed, this could well be one of the best mice we see in 2016! 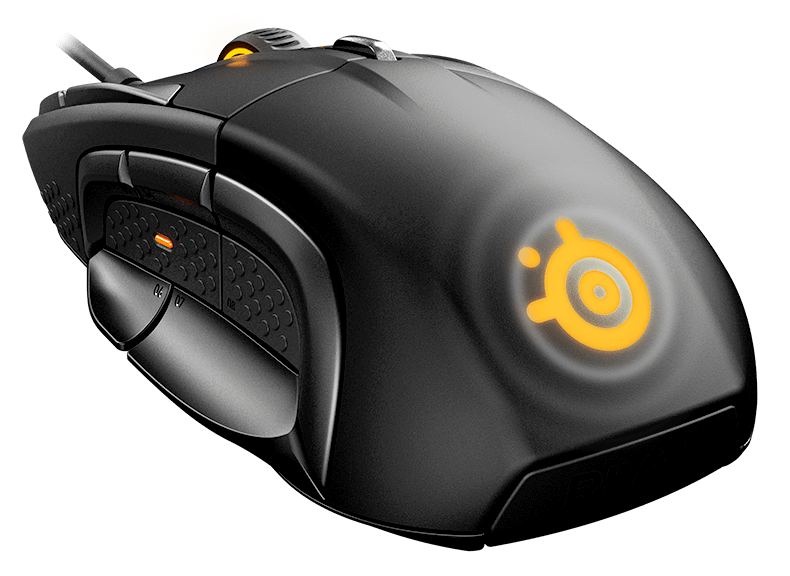 On that note we happily give this new gaming mouse our GGPC recommends award – The SteelSeries Rival 700 is GOOD!